Following up on the previous post, here are some observations along with practical ideas for addressing this important aspect of our work. At the 2016 BIMForum in Atlanta, one of the more interesting presentations examined construction tolerance, camber, and deflection - noting that they are typically not addressed by BIM modeling. The presenter highlighted examples of how each of these adversely affected a specific project, but the incongruities were not revealed until work was being placed in the field. The takeaway was that it is possible to model with perfection what cannot be actually achieved. A corollary that follows is that a clash free building model or a coordinated set of construction documents does not a constructible building make. THE Knowledge of fabrication and installation tolerance as well as the limitations of materials and systems are essential components to constructability. Confusion of goals - the objective is to design and construct a building in the most effective manner possible. BIM can be a valuable process but is not the goal itself. Emphasis on big picture design coupled with a lack of understanding of how actual systems and materials mesh. Lack of skilled tradesman and the constant pressure to hastily execute work. Mistaking proficiency in BIM modeling for a well-executed and buildable design. GC's and CM's that serve as brokers for sub-contractors and who lack experienced field personnel with understanding of how buildings come together. A shared disorder affecting many design firms are individuals who model or draft what they do not understand. It has been referred to as DWOB or "drafting without brains" and similar can be said now for modeling. I have seen firsthand the benefit of building into firm culture the clear expectation that this is not acceptable practice. When executing a design through production documents, we really do not care what someone thinks so much as we care what they know. Yes, it takes time to learn but once the knowledge is gained, there is a recurring and long term benefit and sometimes we need to go slow in order to go fast. Every line or 3D element means something and they should not be casually placed. Shop drawings and submittals can be invaluable manuals for actual fabrication and installation. Sub-contractors will often "adjust" our designs here to be more constructible. In some instances the changes they submit are not acceptable deviations but in most often they are something to be studied and learned from. Learning to rapidly sketch or delineate ideas is a valuable skill, regardless of the medium - paper, a tablet or using CAD or BIM software. It is often important to iteratively study details before committing them to finalized modeling or CAD drafting. Many firms are investing in their employees ongoing education to more quickly mature young architects and engineers. Additionally, interns can avail themselves of opportunities and go out of their way to investigate how work is done and learn best practices for construction. Talk about constructability in the firm and visit your projects under construction or share pics and video of the ones too far away. Jobsite tours with young interns allows for real-time discussions about what works and why, in the context of where it happens. It helps create a linkage between abstract drawings and models and the real world. Note the sequencing of construction and how sub-contractors coordinate with each other to put work in place. Pay attention to how different materials meet, observing how it is done, both good and bad. How are tilt wall panels formed at the jobsite? What are limiting factors, i.e., how close can a door or window opening be to a panel edge? 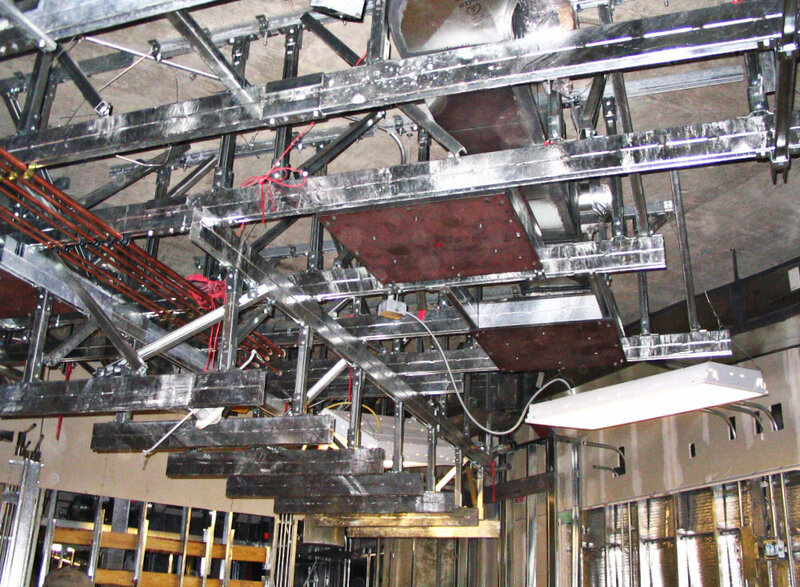 Above ceiling construction for a Hybrid operating room. The value of the equipment being installed exceeded the construction cost! Understand the limitations of poured in place concrete and erected steel vs. drywall and cabinetry. Some work is performed while exposed to the weather, other is done within controlled environments. Cabinets are fabricated to around 1/16" tolerance and placed against drywall or masonry construction that is built to about a 1/4" or so tolerance… And yes, walls and columns are often not quite plumb. Engage with the construction field superintendent (usually the older they are, the better). They have a wealth of knowledge and practical common sense. Walk the job with them, buy their lunch and ask what they would do differently or how could it have been done better or detailed more simply. With a bit of humility you will learn a lot for a lifetime. I don't believe it is ever too early to consider constructability as long as it does not get in the way of letting ideas gestate. As one good project manager put it, speaking of BIM as a tool for constructability - "we want to create collisions early in design to find the most efficient routings and determine how systems best relate. We'll resolve the conflicts as the design progresses.". Constructability can be addressed too late. In my experience, the Design Development phase is usually the best time to "bake" it into our designs. I liken it to making popcorn where you turn up the heat on the stove and when the kernels start to pop, you forcefully shake the pan back and forth causing un-popped kernels fall to the bottom. During Design Development we similarly can "shake" the building, i.e., work through the entire design and adjust elements to fit together well. Key junctures of building materials are examined and we follow interior finishes, expansion joints, and aesthetic reveals around corners, looking at walls and ceilings to ensure they transition in a logical and elegant way. A goal is to achieve both horizontal and vertical dimensional control by the end of this phase for the complete building which requires working through all of the critical details and major systems. Note that I have not said that all details were modeled or drafted in final form or that we dimensioned the documents at this time. Rather we sketched, drafted and modeled enough to thoroughly understand the building in order to determine and set relationships of materials and systems. This obviously sets the project on a level path and the documenting phase just became much easier. A question to ask at your firm - is it acceptable to poorly deliver your building design?